The Hatteras-Manteo Bus Line crossed Oregon Inlet on the Barcelona. Oregon Inlet formed in 1846 when a hurricane struck the Outer Banks, separating Bodie Island from Pea Island. The inlet is said to have been named for the first vessel to pass through it. Seven miles southeast of the inlet, the Pea Island Lifesaving Station was built in 1878. The U.S. Lifesaving Service, the forerunner to the U.S. Coast Guard, had formed in 1871. 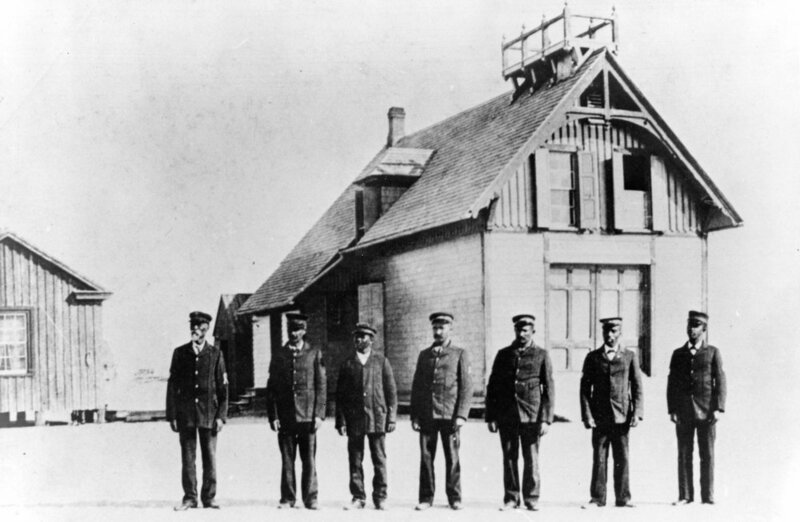 The Pea Island Lifesaving Station was the only station in the United States manned by an all African-American crew. Captain Richard Etheridge, a former slave who served as an officer in the Union Army during the Civil War, served as keeper of the station from 1880 until 1900 and was the first African-American to command a station. In 1996, the Pea Island surfmen were posthumously awarded the Gold Lifesaving Medal of Honor for the daring 1896 rescue of the crew and passengers on the E. S. Newman, a three-masted cargo schooner. The station continued to be manned by an all African-American crew through World War II until 1947 when the station was deactivated. Mary Meekins Gray of Avon recalled traveling across Oregon Inlet with the Pea Island Station crew when she attended the Manteo school in the 1920s. “I had to board and I got home a few weekends. 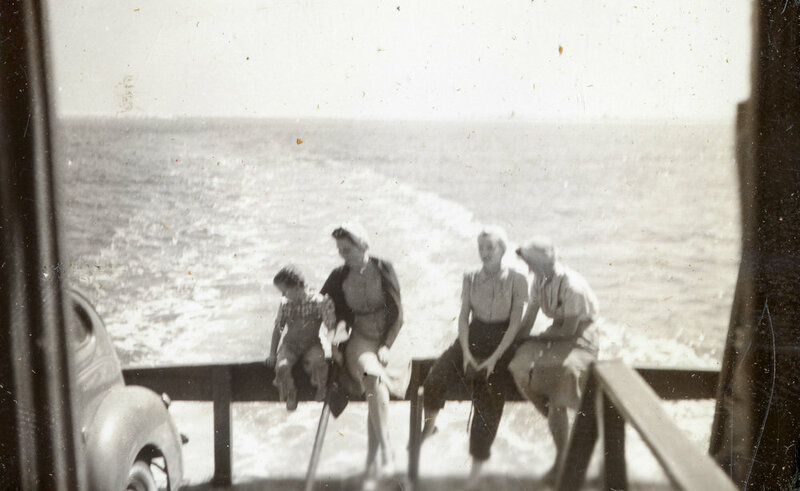 Travel was a little hard but my father was stationed, I believe, at maybe Oregon Inlet at that time. And I’ve often thought about the sailors at Pea Island, you know, the black men. [My father] would take me up to Oregon Inlet, and I’d get on the boats most of the time with them, and they’d take me over to Manteo. They’d be going on liberty and I’d go across with them. That was our mode of travel, either that or the mailboat,” Gray said in a 1988 interview. Ferry service across Oregon Inlet began in 1924 when Wanchese commercial fisherman Toby Tillett started towing cars on a barge tied to the back of his fishing boat. The 30 foot long barge could hold two cars and was “about as easy to handle as a wild mustang on the end of a lasso, for the ocean tides swirling through Oregon Inlet proved so unpredictable,” historian David Stick wrote. Before the end of the year, Tillett replaced the barge operation with a 45 foot long ferry boat called the Oregon Inlet. Up until 1928 when Tillett set a regular schedule for trips, drivers hoisted a flag up a pole on the south side of the inlet to signal that they were waiting to cross. 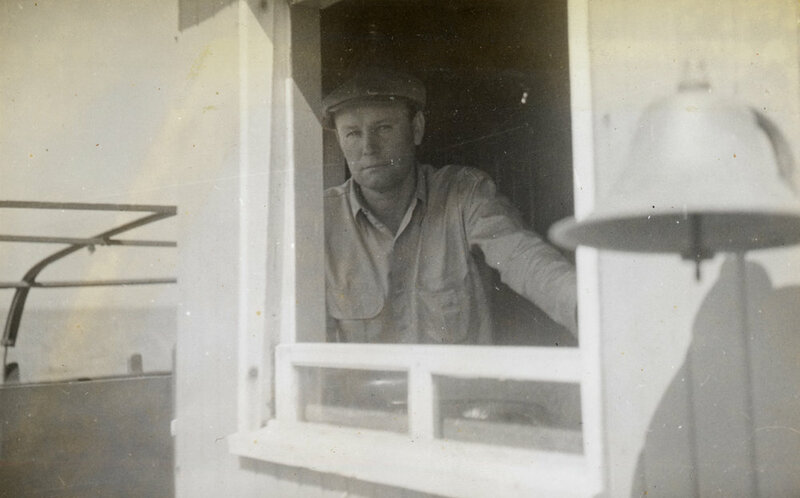 Boat builder, carpenter, and fisherman Rocky Rollinson of Buxton built the Barcelona, able to carry as many as fourteen cars, for Tillett in 1931. “He was a fine boatbuilder. But I guess you could mostly describe him as jack-of-all-trades. I guess you had to be that to survive here. He was a very good and outstanding fisherman. All through this county and other places too, people knew that to be a fact,” Rocky’s son, Belton Rollinson, said. 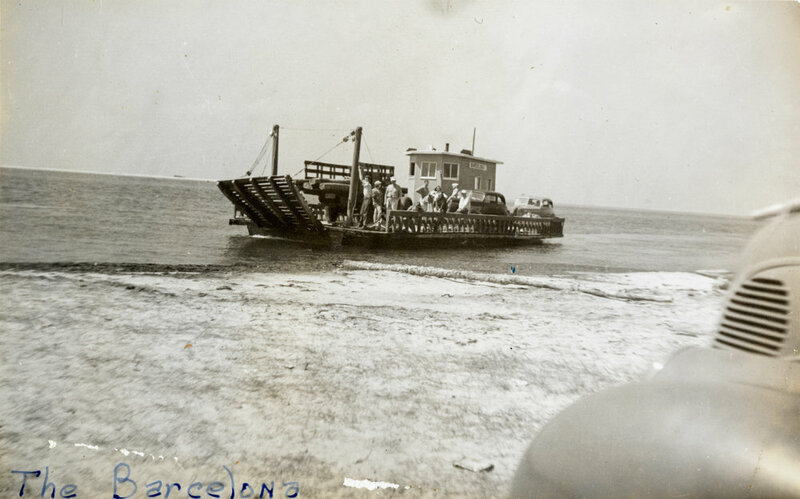 Tillett sold his ferry business to the North Carolina Highway Department in 1950. Regular ferry service across Oregon Inlet came to an end after the Herbert C. Bonner bridge was built in 1963, but continues to be employed during emergency situations. In 1990, service from the south end of Oregon Inlet to Wanchese was established for almost four months after a dredge slammed into the bridge during a northeaster, collapsing a 370 foot span. The state also ran ferries across Pamlico Sound from Rodanthe to Stumpy Point when Highway 12 on Hatteras Island was severely damaged from Oregon Inlet to Rodanthe by Hurricane Irene in 2011 and by Hurricane Sandy in 2012. In There were no roads, Anderson Midgett of Hatteras talks about when, at 17 years old, he & His brothers started running a bus line from Hatteras to Manteo in 1938. Baum, Wayne and Jo Ann Quidley, Sherry Bunting, Michael Gray, and Jeanie Bunting. “The Life of Rocky Rollinson. Boat Builder, Carpenter, and Fisherman.” Sea Chest vol. 4 number 1 (Winter 1976-1977). Gray, Mary. Cape Hatteras National Seashore Oral History Program Interview. 28 July 1988. Pea Island Lifesaving Station Cookhouse. Video. U.S. Coast Guard Station at Pea Island. Stick, David. “Toby Tillett and His Ferry.” The State, Vol 17, Issue 3, 18 June 1949. Digital pages 7 & 19.